The evening of October 2, 1933, was one of those glorious autumn nights where the weather was clear and cool, and the stars twinkled brightly; perfect for romance. So it was that a young man and his favorite girl parked along wooded Ridge Road near the North Providence line. As the couple sat in the car anticipating what might come next, a man with a pistol emerged from the woods. “Stick ‘em up and hand over your dough!” he demanded, as if he were in some B-rated gangster movie. Sepia tone images of those long ago days of the Great Depression seem to reflect a simpler, gentler time, when family values were strong, communities were close, and everyone pulled together. However, the 1930s were also the days of John Dillinger, “Machine Gun” Kelley, and “Pretty-Boy” Floyd, hailed by some as modern day Robin Hoods, robbing banks and committing cold-blooded murder in flamboyant style. Although Rhode Island was spared such notoriety, Smithfield’s police officers still had crime and other problems to deal with. All of the stories contained in this article are true, culled from a collection of Depression Era newspaper clippings donated to the Historical Society of Smithfield by former town resident, Dorothy E. Reynolds. On July 8, 1934, a West Warwick man was arrested in Georgiaville for “reveling”, but not before he put up a tenacious fight with officers. He appeared before the Ninth District Court in Gerogiaville where he pled guilty and was fined $100, which was a huge sum of money in those days. The following month Officer Henry Passano was called to the Stillwater Country Club to investigate a report of a lost wrist watch. The complainant, a Woonsocket man, claimed he removed the watch while washing his hands and forgot it. When he returned later it was gone. On a warm August afternoon in 1937, Chief of Police Alfred La Croix was patrolling along Farnum Pike when he encountered two pretty teenage girls clad only in bathing suits walking home from Georgaiville Beach. After speaking with the girls, he drafted a proclamation banning the practice of strolling along public highways in such attire. The ban, which also applied to non-Smithfield residents, did not include sun suits or short pants. Apparently traveling peddlers had become a nuisance for that September Smithfield’s Town Council adopted a new ordinance requiring all peddlers operating in town to have a license. However, certain vendors, such as butchers, fish dealers, and farmers, were exempt. On October 4, 1937, a seventeen year- old youth accidentally shot himself in the leg while hunting in the woods off Capron Road. Severely wounded and unable to walk, he began shouting for help. Fortunately, his cries were heard by Maria Appleby and members of the Stillwater Country Club who went to his aid. Later that same month, Chief La Croix and School Superintendent Aaron F. Demorganville conferred about the possibility of using older students to establish a junior police squad for the purpose of crossing school children at intersections. 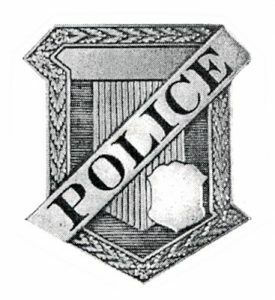 The youthful “officers” would be equipped with a white traffic belt, a badge, and a hand-held stop sign. On October 21, 1937, Smithfield police held their first policeman’s ball with more than 300 people in attendance. Proceeds were used to buy uniforms and equipment for the department. The Ninth District Court docket for May 26, 1938 shows that a Greenville man was fined $20 for operating his motorcycle at an “estimated” speed of 58 mph on Farnum Pike. Two other men were fined $5 for operating motor vehicles without a license. An amusing tale concerning the courtroom wood stove happened on June 24, 1938, when the janitor, following orders, started a fire to remove dampness from the building. He apparently did his job a little too well for the resulting heat from the roaring fire, compiled with normal June temperatures, forced a temporary recess. On the night of February 23, 1939, Walsh’s Roller Skating Rink in Georgiaville was destroyed by fire. Firefighters battled the blaze in strong icy winds while police dealt with hundreds of onlookers. Mr. Walsh vowed to rebuild. A sad incident occurred in April of 1939, when a family of squatters living in a tar paper shack in the woods of Hanton City, sent for a doctor for their sick baby. Upon arrival, the doctor discovered the baby girl dead in her make-shift crib. It was determined the child suffered from severe malnutrition, and died of suffocation due to an overheated woodstove. Conditions in the dwelling were described as “deplorable”. When Smithfield police went to investigate they found the shack deserted. The family, which had two other children, ages 3 and 5, was said to be headed for California. The baby was given a proper burial in at town expense. A Pawtucket man was slightly injured on April 23, 1939, when his hastily repaired two-seater airplane crashed at Smithfield Airport, located where Bryant University stands today. The crash was blamed on a “bad welding job” and the mechanic responsible was promptly fired. The plane was owned by the Smithfield Airport Club, an organization consisting of young men interested in aviation. On March 21, 1940, Smithfield police and firefighters were called to the Lister Worsted Co. Mill in Stillwater after a bolt of lightning struck the 180-foot smoke stack and blasted the top half away. Tons of debris crashed down through the roof of the mill injuring three workers, damaging equipment, and igniting a small fire on the roof. Damage was estimated at $50,000. It is said that lightning never strikes twice. However, the same chimney had also been hit by lightning in 1938, causing $8,000 in damage. One week later, Officer Charles Sullivan was injured when he was struck by a motorist while directing traffic outside Walsh’s Dance Hall on Farnum Pike in Georgiaville. The driver claimed he had not seen the policeman. More than just old newspaper accounts survive to give a glimpse of what the job was like for a Smithfield police officer during the Depression. In September, 2009, Smithfield’s deputy chief of police, Richard P. St. Sauveur, discovered an old iron key that once locked the cell of the Georgiaville bridewell. Before Smithfield had a police station, prisoners were lodged in one of two rented bridewells, a.k.a. jails, one on either side of town. The artifact is presently on display at the Smith-Appley House Museum. Yes, in many ways times were simpler then, but these stories illustrate that the job of a police officer has always been tough and challenging.